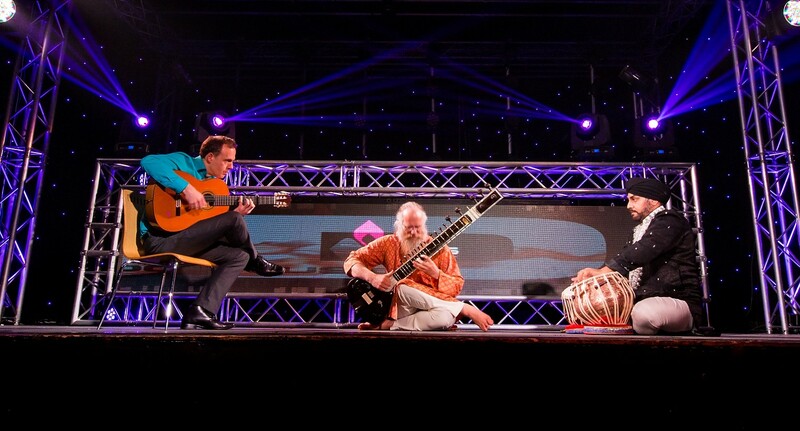 Combining a variety of instruments, the sitar tabla and guitar player create a unique effect. Combining a variety of instruments, the sitar tabla and guitar player create a unique effect. If you're looking for a mix of east-meets-west, then this is the perfect entertainment choice for you. Whether a party, wedding, or sit down meal, music is the perfect accompaniment, and this group of musicians can be booked through Kudos Music. Playing a variety of styles, the sitar tabla and guitar has the Indian influence combined with the western stylings of the guitar, which make it an intriguing and interesting listen. The overall effect is soothing and gives your guests something beautiful to listen to as they enjoy their food or mingle with friends. The tabla and sitar are often played together and create a mysterious, haunting quality of music that all ears can appreciate the beauty of. Ideal for events where something more toned down but impressive is required. The guitar adds a different element to the mix and creates a twist on the usual pairing of tabla and sitar, and will give your ears something to appreciate. With the fusion of the guitar, tabla and sitar comes an ambient and peaceful atmosphere that'll also give you something to watch in awe. These skilled players are available to book through Kudos, and if you would like to book for your big day to play you in, or to play in the background while your guests enjoy the evening then get in touch with us today. Why not book a Kudos Sitar Tabla and Guitar for your wedding or event today! Contact the sales team to see how we can find the perfect entertainment for you.